We left the Kerouac exhibit feeling exhilarated and highly focused, as if we'd been in another world. We took the no. 6 subway downtown ... all the way to Chinatown ... as I wanted to see the Mayahana Temple on Canal Street, a Buddhist temple I'd read about. When we emerged from underground, there was madness everywhere! Confetti on the streets, people bustling everywhere and all seemed happy. We started walking and there ... to our left ... a red dragon! Stop, I said to Greg, let's see what's going on. The red dragon was part of a small parade of very spontaneous revelers, who were going in to businesses, then coming back to the sidewalk. We weren't sure what was going on, so we kept walking down Canal Street toward the temple. When we arrived at the temple, I felt an inner sense of joy, as it was my first-ever visit to a Buddhist temple. As soon as we stepped inside, I was riveted. A small Buddha in a vestible had offerings before it ... oranges, flowers and oil, though I'm not sure the significance of the oil bottles, regular cooking oil. We entered the main worship area and there it was, an enormous 16-foot Buddha. Faithful were making prostrations at one of three kneeling benches, and a group of three young girls were trying to figure out what their fortunes were. For $1 you could pull a fortune scroll out of a bin and because of their English skills, and because the fortune was a bit esoteric, they asked me to explain. On the walls around the room were scenes from the life of Buddha. Many names are used for Buddha, including "Shakyamuni," one of Jack Kerouac's favorite. I struggle to keep them all straight, but learned that day that "Shakya" was the family name, and "muni" means "wisest." So he was the wisest of the Shakya. I could have rested there all day. We were the only caucasians; everyone else were devout easterners. 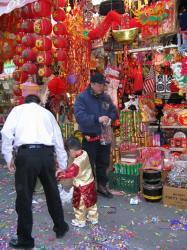 At the gift shop, we learned what was going on: IT WAS CHINESE NEW YEAR! No wonder there was such crazy celebration on the streets! The girls at the shop also told me that it was the Year of the Rat ... and I was born in a rat year, so am a rat ... by the way considered clever and agile by the Chinese ... and would need special protection this year. I purchased an ox amulet to protect me from wrathful oxes that I could clash with this year. I am also to wear something red at all times. We ate in a restaurant full of revelers, with streamers covering the floor, the meat hanging in the front window, and firecrackers going off outside, as it is getting dark. We left and boarded the no. 6 train and headed back to the hotel.